Our vision is to ensure the long-term conservation of all native plants and animals in the Sunshine Coast Hinterland by protecting, restoring and connecting habitat - the rainforests, heathlands, eucalypt forests, rivers and wetlands of our beautiful and wildlife-rich landscape. We support landholders to protect and restore their own land, and to create habitat connections with neighbours. This includes people with urban backyards through to those with large blocks and farms. This work is based on a scientific plan for connectivity being developed for the entire Hinterland region. Support offered includes education and direct advice for landholders, assistance with seeking funding for restoration works, coordination of voluntary community labour for some works, and input to ecological management of both private and public lands. Hinterland Bush Links was launched in 2011 and was hosted by Barung Landcare Association .until we incorporated in 2015. We work collaboratively with a wide range of agencies, community organisations and landholders across the Sunshine Coast Hinterland. Susie Duncan is the founder and Coordinator of Hinterland Bush Links. Susie has over 30 years of experience as a wildlife researcher and successful hands-on conservationist and is passionate about involving local people to protect wildlife and re-connect habitat in the Hinterland. 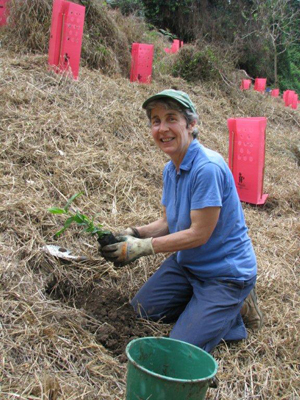 She is employed part-time through an Environmental Levy Partnership with Sunshine Coast Council and the remaining time as a volunteer. All additional funding received by the project goes directly to support restoration work on the ground. Sue Brieschke joined Hinterland Bush Links as the Project Officer in April 2015. She brings a wealth of educational and organisational experience from her career in education and has a great interest in, and love for our regional environment. She is employed part-time through donor funds. All additional funding received by the project goes directly to support restoration work on the ground. The Hinterland Bush Links project is guided by our Management Committee. This is a widely skilled group with experience ranging from restoration work to community education. The members of the group are: Liz Saunders, Kim Holcroft, Mary Meadows, Paul Magee, Fergus FitzGerald, Paul Prociv and Melissa Prociv. To date, funding support has been provided by Sunshine Coast Council, Great Eastern Ranges Initiative, Burnett Mary Regional Group, Mary River Catchment Coordinating Committee. The Queensland Department of Environment and Resource Management and Foundation for National Parks & Wildlife. Several private donors have contributed generously to our work; Jane Abercrombie, Marek & Libby Malter, Jenny Allen, Barry Traill and Susie Duncan. In kind support has come from Barung Landcare, Lake Baroon Catchment Care Group, Queensland Water and Land Carers, Funding received has enabled Hinterland Bush Links to undertake a wide range of on-ground habitat restoration and connectivity projects as well as community education and training to extend this work. Your support would assist greatly, see Get Involved.